Yes, that's it. The work was done well to definitely good results! AccentZPR quickly restores passwords for classic zip archives and WinZip archives. It accelerates on AMD/NVIDIA graphics cards and uses work scripts to perform dictionary attacks and has skillful settings for masked attacks. This all shortens the #passwordrecovery time. 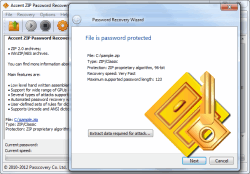 Related articles Accent ZIP Password Recovery : What does the Best ZIP Password Cracker Hide Under the Hood?